At The City Reliquary, 370 Metropolitan Avenue, Williamsburg. 7pm. $7. More info here. This is the second iteration of a monthly “art party,” sporting a whimsical theme and featuring a slew of performances from artists of all disciplines, including live painting, interactive performance art, a human canvas, a bug petting zoo, and an alien experiment. 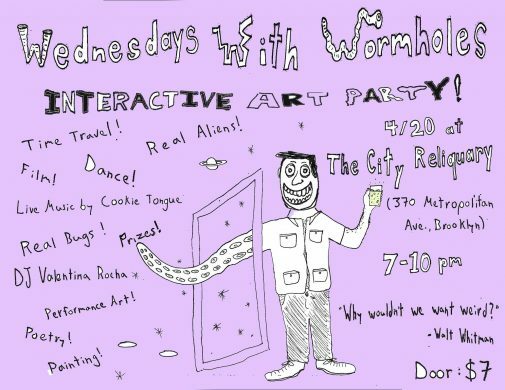 Naturally eschewing any average theme for an event, this evening is themed for wormholes. You heard that right. Whether it be actual worms digging holes or folks traveling through space and time or something else entirely, expect excitement and unusual sights at every turn. Continues through March 19 at The Bushwick Starr, 207 Starr Street, Bushwick. Wednesdays through Saturdays at 8pm. Tickets are $18 and can be purchased here. More info here. 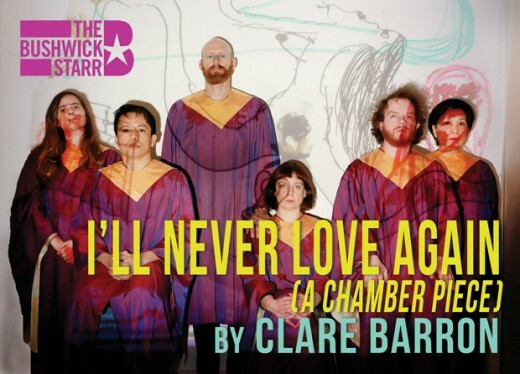 Playwright and actress Clare Barron premieres a new work at the Bushwick Starr exploring the formative teenage events of first love and first heartbreak, constructed from her actual teenage diary. The piece is brought to life chorus-style by a group of celebrated performers, and features original music. Barron has recently won awards for playwriting, and from what I’ve read of hers in the past, her work is soft and strange, relatable but very specific. This show is sure to carry the same satisfying flavors.